Providing short and long term project management services and consultation to issuers, banks, financial institutions, retailers and internet companies utilizing TSYS cardholder platforms. With over 100 years of "hands-on" TSYS specific project management. TWK provides "resource relief" to companies needing assistance in the implementation of their business plans by managing your project or working with existing implementation teams. TWK is a proven resource which has managed and assisted with numerous TSYS implementations. Contact us for details on how we can help your organization today. 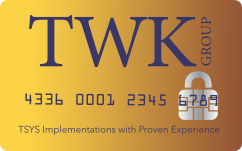 TWK Consulting Group provides short and long term project management services and consultation to credit card issuers, banks and financial institutions. Our consulting experience includes major retail organizations, credit card processors, financial institutions and other consulting companies. TWK Consulting Group is qualified to lend specific guidance during your implementation and provides similar services for the post conversion production environment. A major leading US retailer starting a large credit card portfolio was having issues getting a TSYS production support unit organized and implemented. In late 1997, a corporate decision to liquidate and divest First Omni Bank’s 1 million account credit card portfolio threatened to end the 15 year career of Tom Kloetzli.